The American Thinker has published as a blog item my review of President Obama’s so-called regulatory review (You call this regulatory reform?). Under the direction of Professor Cass Sunstein, President Obama’s former University of Chicago law school colleague, all federal regulatory bodies were to eliminate regulations which were unduly burdensome to small businesses. Private sector critics promptly called the reforms a drop in the bucket. Let’s look at that. Professor Sunstein claims that the reforms could save businesses over $10 billion in compliance costs over the next five years. The Small Business Administration reports that the total cost of regulation to American business is $1.7 trillion annually. If we assume that Professor Sunstein’s savings estimate is reasonable, and that regulatory costs will not increase over the same time period (a very unreasonable assumption), that makes the total savings from the regulatory review equal to 0.001% of the costs of regulatory compliance. That’s one-thousandth of one percent for those who like their numbers spelled out. “Drop in the bucket” overstates the impact. Another way to measure the gross impact of federal regulation is to count the pages in the official publication of all federal regulations, the Federal Register. This is a bit crude as a measure, because a very long regulation may be fairly innocuous whereas a short one could have a massive cost imprint, but it is a decent rough gauge of the extent of the totality of federal regulation. The Federal Register for 2010 is over 81,000 pages long, a 19% increase in one year. We do not have a page count on the regulations to be repealed, perhaps because many of the revisions have yet to actually go into effect, but it is safe to assume that they will come nowhere near to matching the voluminous regulations still to be issued under the new Obamacare and Dodd-Frank laws. And there are also the numerous ongoing rule-makings by Professor Obama’s hyperactive regulators at the EPA, NLRB and the rest of the seemingly endless alphabet soup of federal regulatory bodies. However, all this begs a deeper question: why is the national government regulating small businesses in the first place? To put this question in perspective, the Federal Register was first issued in 1936. At that time it was 2,600 pages long (and that was after four years of the New Deal). The Left will argue that growth in federal regulation is inevitable as our Nation grows. So, let’s look at that. From 1936 to 2010 the population of the United States grew by 240% (128 million to 308 million). Over the same time period the Federal Register grew by over 3131%. That means that the page count of federal regulations has grown at over 13 times the rate of population growth since the middle of the New Deal. And again, as noted, Professors Sunstein and Obama still have much, much more regulation to come. One of the reasons the first Federal Register of 1936 was so short was that up until then the Supreme Court had followed the original understanding of the Constitution’s interstate commerce clause, which limited Congress’ authority to commercial activity that actually crossed state lines. However, the next year in 1937 the Supreme Court began to abandon the previous understanding of the interstate commerce clause. Under the new interpretation anything that might maybe in any way have any affect on any kind of commerce any where was deemed to come under the federal Congress’ power. This included any business no matter how small it was and no matter how local its activities were. The classic case is Wickard v. Filburn, a 1941 case which held that an Ohio farmer could be fined for violating federal agricultural quotas for food grown for use on his own farm! This massive re-interpretation of the Constitution’s interstate commerce clause completely overthrew the Constitution’s original allocation of powers between the federal and state governments. Small businesses were now subject to a double burden of federal as well as state regulation. With Obamacare it is now even claimed that a private individual citizen can be penalized under the clause regulating interstate commerce for failing to buy something the federal government says they must buy. Where did the Supreme Court get the right to make such a massive change to the original meaning of the Constitution? It certainly is not in the Constitution itself. There it says that to change the Constitution you have to get various super-majorities of elected legislatures. There is nothing about courts changing the Constitution. In fact, the entire edifice of the federal regulatory state rests on an undemocratic and unconstitutional expansion of the interstate commerce clause by a body without constitutional authority to make such an expansion. Unfortunately that expansion is now locked into 70 years of Supreme Court precedents. Even if the current Supreme Court declines to further extend the expansion by overturning the Obamacare individual mandate, that will still leave in place the other 81,000 pages of federal regulations, and many more to come which fall just short of the individual mandate. Republicans in Congress have several legislative proposals to alleviate the federal regulatory burden on small business, but given the morass of special interests behind all of this federal regulation, it is hard to see how Congress will ever make a meaningful dent. 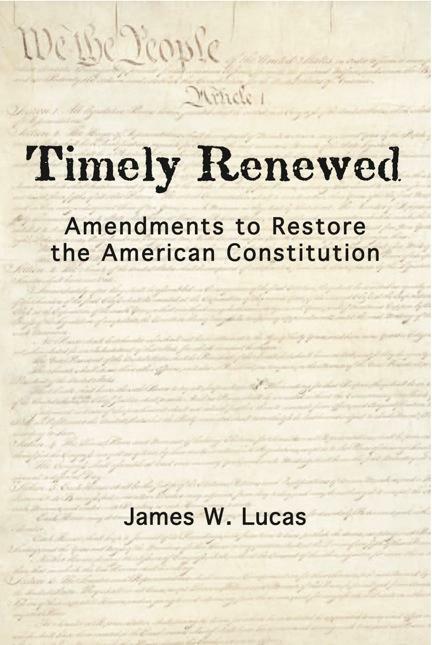 In Timely Renewed: Amendments to Restore the American Constitution, I propose instead that we re-invigorate the constitutional amendment process to restore the original meaning of the interstate commerce clause, along with other much abused clauses. The specific proposal for restoring the interstate commerce clause’s original scope is in chapter 6. With this, small business would be regulated only by the states instead of “one-size-fits-all,” Big Business oriented federal regulations. Only this will really achieve Professors Sunstein and Obama’s purported goal of relieving small business of the regulations which are stifling their ability to produce the new jobs we so desperately need.